Buy the look: Sunday Brunch . : Sequins and Sand Resort Wear :. Relaxing back. Time to breathe and just be. A spot in the gently warming sunshine. There's a little sharp coolness in the air. The coffee is soothing and the conversations...well, there might not be much at all. And that's absolutely fine. This is your time. Trusty, comfy clothing a must. Go-to pieces that you know time and time again help you relax and look good. Perfect for adding extra warmth without the bulk of heavy sleeves. 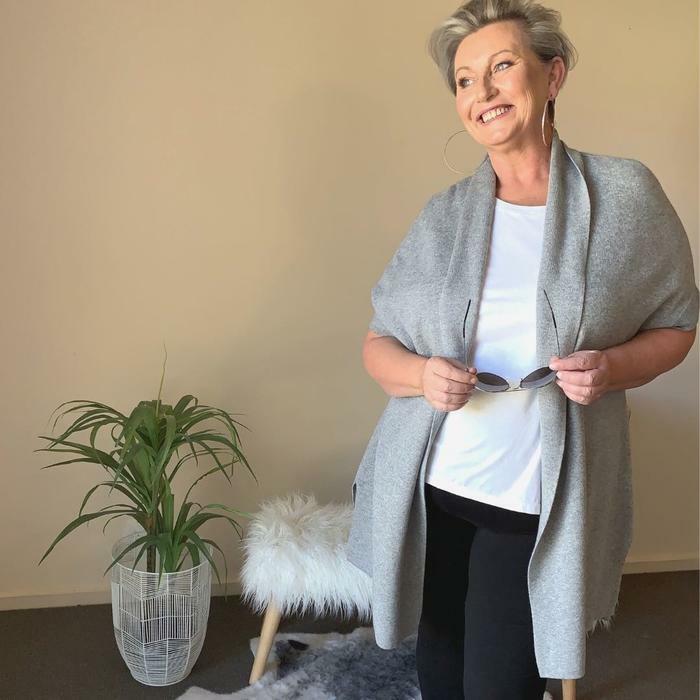 This long line cardigan vest is a heavenly blend of Cashmere, and Cotton for softness with Viscose and Nylon for a 'shape'. We know as soon as we tried this knitted vest on that it had to be included in our Getaway Collection. So snug and stylish! It's all in the weight and how it sits on your chest. And the arm holes are brilliant! That may sound wierd but with so many 'batwing' or wider sleeve tops and dress styles out there (which are fabulous) it's hard to layer them up with a regular vest or jacket. The arm holes on this vest are generous enough to accommodate them without creating bulky gathers under arms. Simple solution. Brilliant outcome. This Getaway Collection vest comes in two colours, Grey and Vintage Rose. See how Evie has put this item from the Getaway Collection into an effortlessly stylish Outfit Idea. 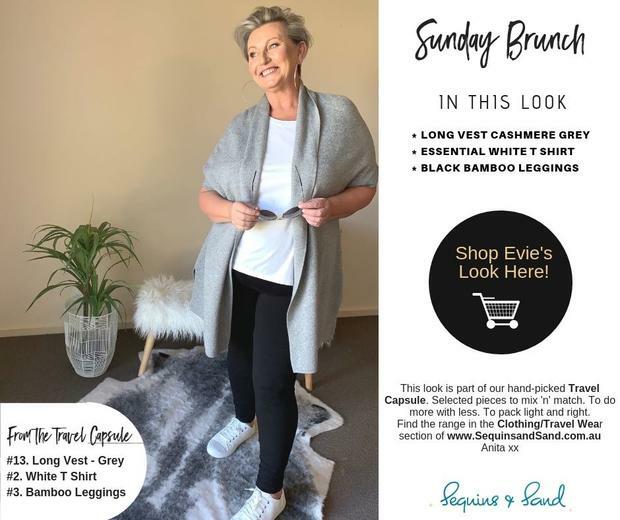 Shop Evie's Look here! OMG! These bamboo leggings are amazing! So super soft and comfortable. There is a thickness to them too that is just right. The length is great and so is the slightly generous fit. Heavenly to layer under your dresses, skirts and long tops when traveling and when the months get a little cooler. Won't bag at the knees! Such a great price for the quality. A wardrobe essential for home too. Once you've tried these bamboo leggings, it will be hard to stop at one! Those who wear Bamboo reluctantly wear anything else. They have discovered the wonder of this fabric for its softness and super high comfort factor. It breathes so well AND with its natural anti-baterial properties won't 'smell' after a sweat like other fabrics do. It will take longer to dry, so we suggest spot cleaning as needed and then when you get to a location where you have 2-3 days, launder thoroughly and let it dry. Did you know that bamboo fabric also have an inherent sun safe factor too! All in all bamboo makes a great travel wear and day to day option. Got Menopausal or post chemo hot flushes? We have had so many customers say that bamboo keeps them cooler and that they love it for that. Comfortable extra wide waistband - like a yoga pant - no elastic digging in girls! Naturally Anti-bacterial and UPF for added sun protection - you get that with bamboo fabrics. Anti-bacterial is great for traveling when you don't get to wash clothes most days. The darker the fabric, the better the UPF rating. A basic white T shirt is a wardrobe and travel suitcase essential. This super soft, cotton, relaxed fit short sleeve cocoon-shaped T-shirt is the T you’ll reach for time and time again. It's from our mates over at Hunt Kelly. 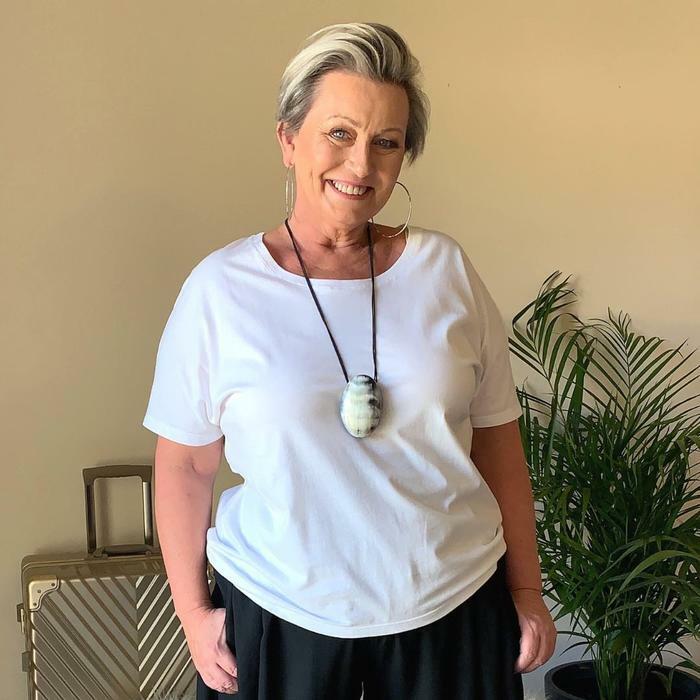 The ultimate in flattering fit, the soft cotton scooped neckline has an extended sleeve and will not cling to any areas you’d prefer it not to. Evie has layered this White T Shirt with basic black bamboo leggings and a long line cardigan vest. So simple and easy. Travel perfect and weekends away no-brainer. Shop Evie's Look here! Sizes 0,1 and 2. Evie is in the 2 and is an 18.